Help Us Fight Heart Disease and Enter to Win! Posted on Saturday, January 31st, 2015 at 8:08 pm. 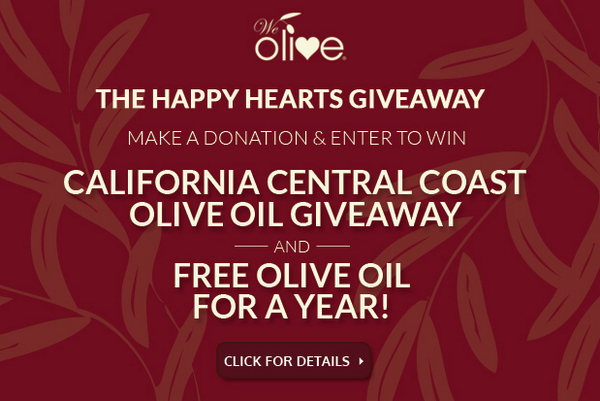 Win a California Central Coast Olive Oil Getaway! We believe that a happy heart is a healthy heart and that a healthy lifestyle can be a delicious pursuit. One lucky supporter of our Happy Hearts fundraiser will win a trip to California’s Central Coast that’s worth its weight in liquid gold. The winner will receive a three-night stay in luxury accommodations at Summerwood Winery & Inn, a tour and tasting at an award-winning Paso Robles olive mill, specially-prepared olive oil-focused meals, winery tours and more! Click here for official rules and information on entering. Visit a We Olive location near you to donate and enter or donate and enter online now! Win EVOO for a Year! Consuming just two tablespoons of EVOO each day can protect your heart from heart disease, according to the FDA. In order to help you establish this healthy habit and help the American Heart Association raise money in the fight against heart disease, we are giving away a one year supply of olive oil! You can enter to win when you visit any We Olive location nationwide and make a donation to the American Heart Association. Each We Olive store will select a winner which means 14 lucky olive oil lovers will receive EVOO for a year! We’ll also be doing weekly giveaways of olive oil, so you’ll have lots of chances to win. Click here for official rules and information on entering.